January means it’s time for the drawing of N1 WI’s next educational bursary – our 4th so far! 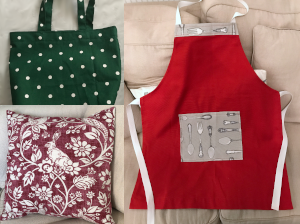 The first was used on a lovely cookery course, the second was used for a sewing course to make a cushion cover, a tote bag, and an apron, which you can see in the photo above, and the third is going to be used for a willow weaving course. What would you fancy learning? The bursary gives you £100 towards an educational course of your choice, and the money can also be used towards travel and materials related to the course. To enter the bursary draw all we need is your name, email, contact number and planned area of study – you can email this over to hello@n1wi.co.uk if you can’t make the meeting. You have to be a paid up member of N1 WI to enter, so make sure you get your membership sorted before or at the January meeting! 2019 membership is £42 for the year (that’s £3.50 a meeting! ), or £20.50 if you’re a member of another WI branch already, and you can pay by bank transfer, or bring cash or cheque to the January meeting. To pay via bank transfer use the following details and please email us at hello@n1wi.co.uk to make sure it made it across. You can see more details of how to become a member as well as what other benefits you get from joining here and you can find full details of the N1 WI Educational Bursary here.